24 September 2016 – 8pm, Nun’s Cross Church, Ashford, Wicklow: €15/€12. 18 September 2015 – 8pm, Culture Night Concert, Thomas McDonagh Centre Cloughjordan Tipperary, 7.30, free admission. Saturday 5th December, 8pm, ‘Songs of the Season’ Christmas concert, Tramore Coastguard Cultural Arts Centre, Tramore, Love Lane, Co. Waterford. Tickets €14/12. Complementary mulled wine. Phone (051) 391656. 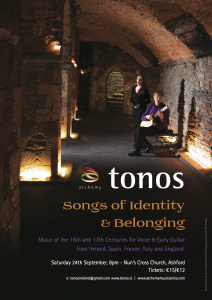 ...among Ireland's most vibrant and imaginative early music performers. Jan Smaczny, Hamilton-Harty Professor of Music, Queen's University. O'Grady has a beautiful voice, full of emotion... Sweeney was the perfect complement.